On arriving in Auckland, do you point your compass north and travel up through the breathtakingly beautiful Northland – the symbolic heartland of New Zealand – or do you commence south through the rolling hills of the Waikato region, eager to begin exploring the volcanic wonderland of central north island? My recommendation – point your compass north. You won’t regret it. 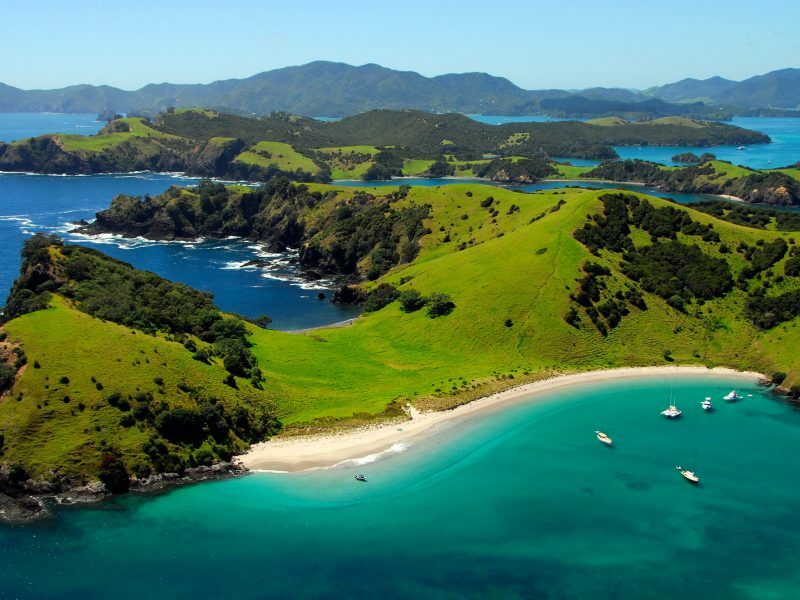 The Bay of Islands, located on the eastern ridge of Northland is one of New Zealand’s most beautiful and historic areas. It is an area of outstanding natural beauty where aquamarine waters, sheltered coves, breath-taking beaches and quaint coastal settlements exude a sense of tranquillity far removed from the hustle and bustle of neighbouring Auckland. Yet the Bay of Islands has a tempestuous past, a past that lives on in the many cultural artefacts, museums and of course living descendants of local Maori who once ruled this little corner of paradise. To discover this past, to visit the birthplace of the nation and to understand its pivotal significance is to imagine the giant sails of the European boats descending onto the shorelines of Northland, it is to envisage the local Maori and inquisitive Europeans trading timber, food, women and alcohol, it is to visualise the turbulent relations between indigenous natives and audacious explorers and it is to understand the heritage, culture and identity of the world’s youngest country. Thus by definition it is an area of New Zealand anyone with a love of history, culture and dramatic scenery simply must visit. The best known settlement in the Bay of Islands is Paihia, a coastal town that started life as a missionary’s outpost in 1823. The missionaries may have long gone but the settlement remains one of the best places to base oneself when exploring the Bay of Islands. With a plethora of accommodation options, a wide ranging variety of eateries from cafes, to water-front restaurants and a multitude of activities on the doorstep, this quaint coastal town offers far more than one might expect at first glance. For those excited most by Maori history, an absolute must is a visit to the nearby Waitangi Treaty Grounds and the recently renovated Museum of Waitangi. Here you can learn about the Treaty and history of the Bay of Islands direct from the original descendants, see a traditional Waka (war canoe), visit the Treaty House and admire the imposing flagstaff and spectacular views across the bay to Russell from the Treaty Grounds. If wildlife and getting out on the water is more preferable then joining the iconic Hole in the Rock cruise at Cape Brett is paramount when visiting the Bay of Islands. Cruising daily out from the wharf in Paihia via Russell, this iconic cruise meanders through a plethora of islands and inlets, passing by derelict lighthouses and workman’s settlements which were once a guiding light for those at sea, right out to the most easterly point of the Bay of Islands. 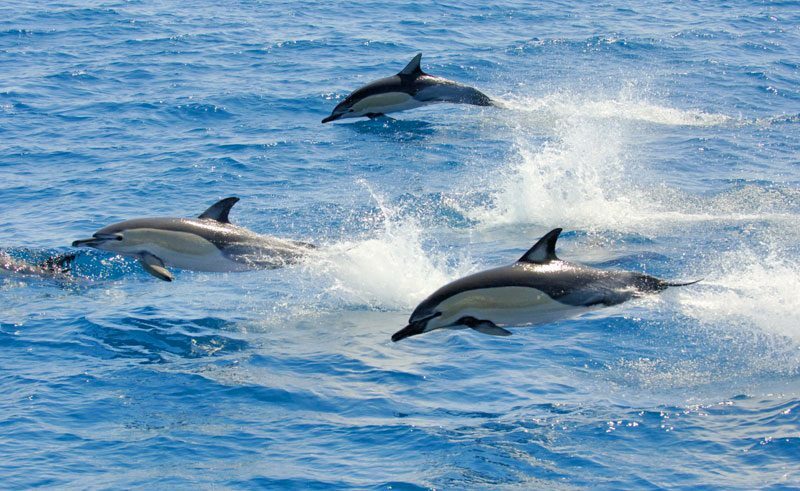 If you’re lucky, Northland’s dolphins may appear beside you revelling in the boats wake and keep your cameras poised for seals basking on rocky outcrops. Birders won’t be disappointed either as the lack of predators on the islands has meant native birds settle in abundance in relative harmony here. Yet all this is secondary to the main attraction; the Hole in the Rock, a naturally eroded rock that is not only outstanding in beauty but also highly significant culturally for the local Maori – being the Gateway to the Bay of Islands. After cruising right through the Hole in the Rock you will anchor at the tranquil Urupukapuka Island where you can ascend the small incline to the top of the island for 360 degree views of this untouched landscape. Back on board your will cruise will end at the waterside settlement of Russell – the perfect base for a spot of lunch before catching the bi-hourly ferry back to Paihia. At the turn of the 19th century, Russell (which is a mere ten minute ferry crossing from Paihia) served as the resting point and shore station for ex-convicts turned whalers, a disorderly settlement that became famed for prostitution, alcoholism and unruliness that earnt the title of “The Hellhole of the Pacific”. Fortunately, today, Russell has been transformed. The whalers are no more, the prostitution and alcoholism a distant memory and what remains is a quaint seaside settlement better known for game-fishing and oyster farming than rebellion. That’s not to say Russell has lost its character or antiquity – far from it. Spend a couple of hours here indulging in history and visit the iconic Russell Museum, New Zealand’s oldest Anglican church and the nations original industrial printing house – Pompallier Mission, all before enjoying a delectable lunch of freshly caught seafood at New Zealand’s first licensed hotel – The Duke of Marlborough. Another iconic thing to do when visiting the Bay of Islands is to see it from above. It is the only real way one can appreciate the vastness and superior beauty this region is famed for. Departing from Paihia, take to the skies on scenic helicopter flight over the islands even flying right out to the Hole in the Rock to see this geological wonder from a different perspective. Definitely the highlight of my trip to the Bay of Islands. 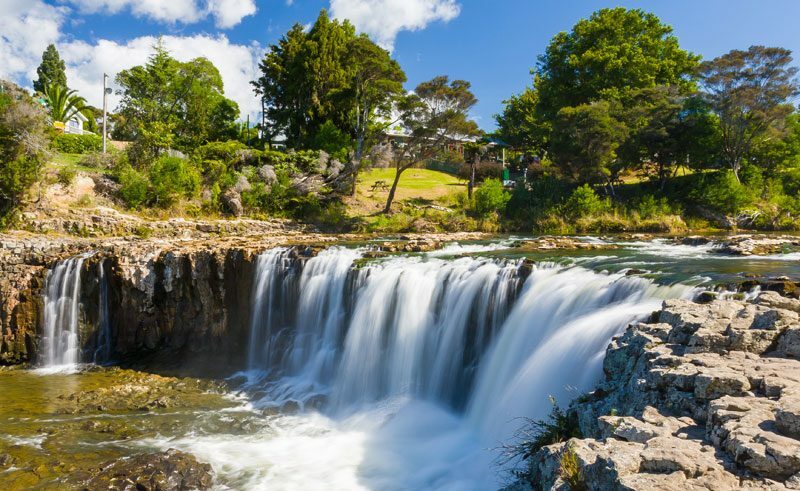 Northland however isn’t just about The Bay of Islands – there are a multitude of other places to visit and activities to enjoy which warrant you heading north out of Auckland. For example, travel up to Cape Reinga to witness the converging of the Tasman Sea and Pacific Ocean, explore the longest beach in the country, “Ninety Mile Beach” or if diving is more your thing the marine reserve at Poor Knights Islands will be well worth a visit. Northland is one of New Zealand’s most under-stated regions. Although popular in the summer months, the region is relatively quiet in the off-season and remains an area of New Zealand yet unspoilt by the mass footprints or car fumes of roaming contemporary travellers. So point that compass North and head up into the most historical and cultural region of New Zealand – you may not leave your mark on Northland but it will certainly leave its mark on you! Naomi visited Auckland in New Zealand’s autumn. You can follow in her footsteps on a host of holidays in New Zealand.. Contact our Travel Specialists or call us on 01737 214 250 today. Award winning wine expert, TV personality and columnist Olly Smith visited New Zealand's Bay of Islands where he discovered that the pressure's off, but the adventures are on. With so much to see and do in New Zealand, planning the perfect itinerary can seem like a daunting task. With 35 years' experience and expertise, we've collated our essential New Zealand bucket list. Lindi, our Australasia Product Manager, gives us her top 5 reasons to visit the city of Auckland in New Zealand's North Island.